Jewish Federation CEO, Helene Lotman and Matti Friedman discuss his book and current events in Israel. The presentation will be followed with a book sale/signing and reception. 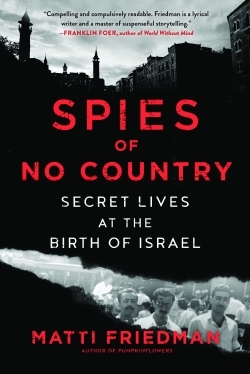 Spies of No Country is about the slippery identities of these young spies, but it’s also about Israel’s own complicated and fascinating identity. Israel sees itself and presents itself as a Western nation, when in fact more than half the country has Middle Eastern roots and traditions, like the spies of this story. And, according to Friedman, that goes a long way toward explaining the life and politics of the country, and why it often baffles the West. For anyone interested in real-life spies and the paradoxes of the Middle East, Spies of No Country is an intimate story with global significance.